UPDATE - RESULTS POSTED. OPEN RACE STILL IS BEING WORKED ON FOR TIMES +31 MINUTES. Since this will be our first go at doing this, please excuse us if we experience any technical difficulties! TEAM ENTRIES CLOSED! 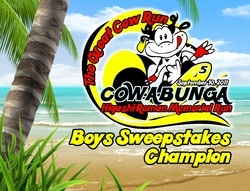 WE ARE STILL ACCEPTING OPEN RACE SIGN UPS. SEE FORM BELOW! 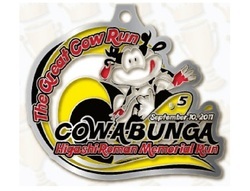 The Great Cow Run began in 2006 as the Cerritos Cross Country Invitational. 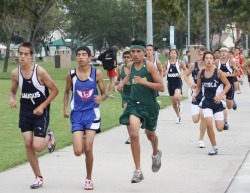 Due to construction at Cerritos Regional Park, the invitational did not race its second annual invitational until 2008. 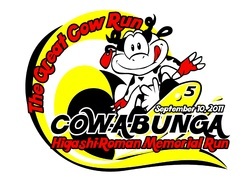 With a new course and a beautifully redesigned park, the Great Cow Run is hosted on beautiful course that runs across a flat grass and cement course that is viewer friendly. 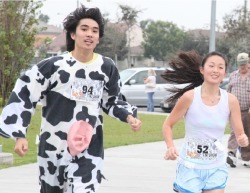 In addition, the invitational has grown in order to incorporate the theme of the cow (due to the history of Cerritos formerly known as Dairy Valley), as the lead bikers and runners dress in cow suits and the opportunity for photo ops with these cows is presented throughout the day. In 2010, the Chik-fil-a cow also paid a visit to the course to help promote for their Cerritos store located at the beautifully redesigned Los Cerritos Center. The meet provides a balance of quality team and aims at awarding as many individuals as possible! Join us for our fifth annual invitational on September 10, 2011, which we hope will be as great as an invitational as ever in one of the best cities around!